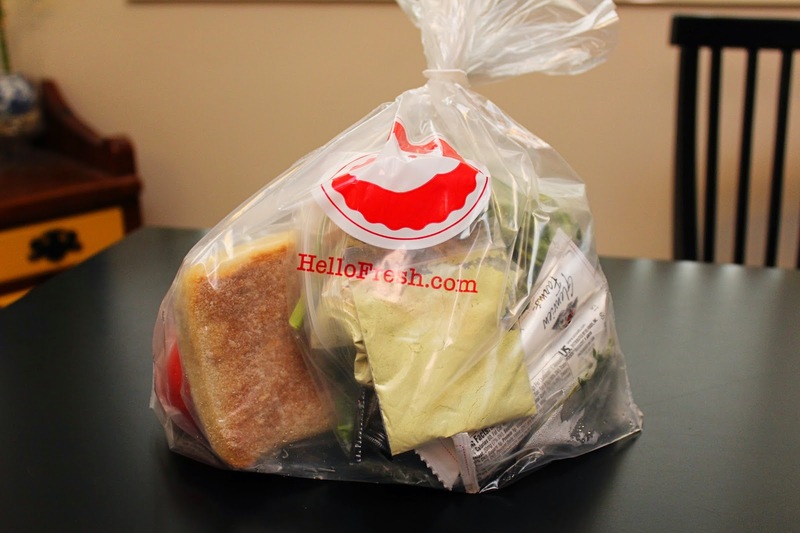 Recently we tried out a new food delivery service called Hello Fresh. 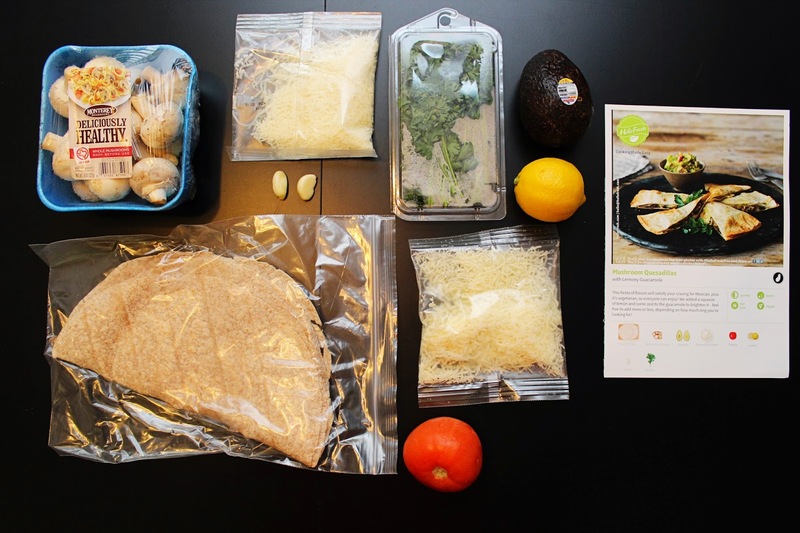 It's similar to Blue Apron, which we've tried twice before. I got a $40 gift card towards the purchase of the box, so all three meals cost us just $30. Psssst.... there's a code at the bottom of this post to get you $40 off, too! The box the food came in was a lot smaller than the Blue Apron box, but everything seemed to fit well and nothing was crushed. 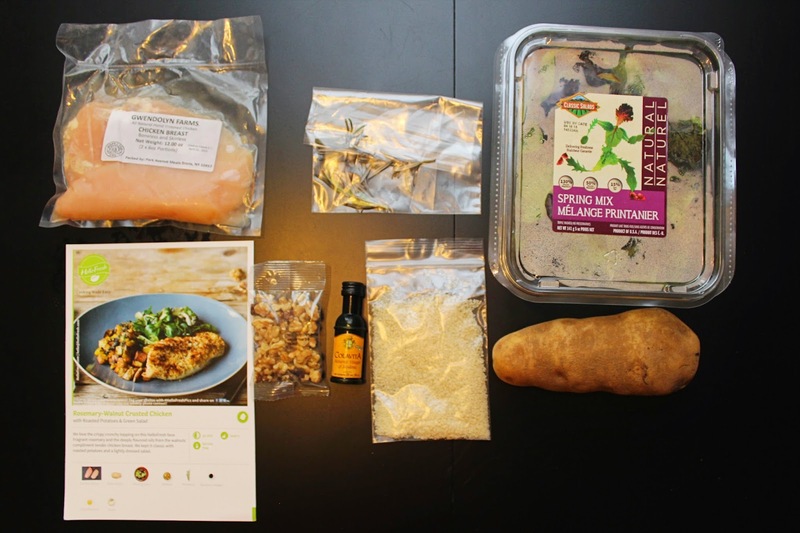 Unlike Blue Apron, Hello Fresh puts all the ingredients for a recipe in a bag, which was convenient. 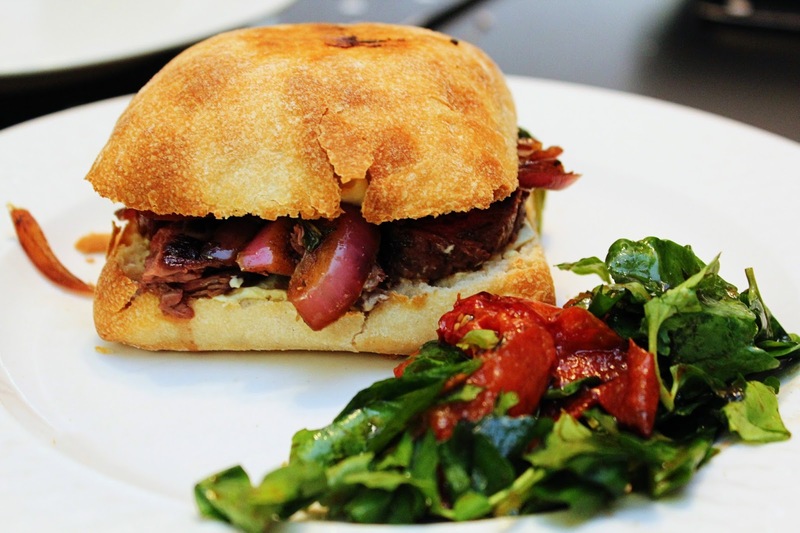 Here's what we cooked up with Hello Fresh! The idea behind this meal was great. I'm a huge mushroom lover, and I recently discovered that avocados aren't the evil I thought they were. However, we weren't given nearly enough mushrooms to fill four tortillas. I'd say we would have needed at least double to make a nice hearty, stuffed quesadilla. Ground turkey or chicken would be nice, too, but this was our vegetarian option for the week. The filling was delicious, none the less, and the guacamole was a nice touch, and almost made up for the lack of 'shroomies. Both Ant and I agreed that the guac would have benefited from a little onion. 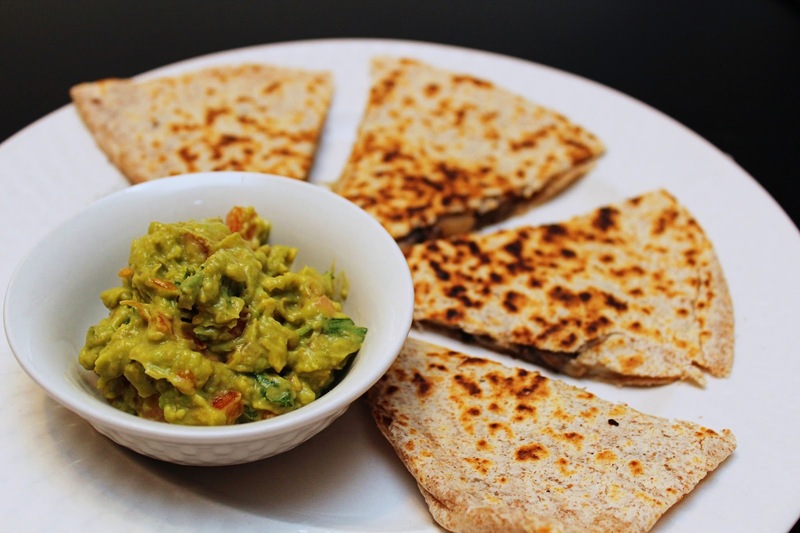 Leftovers: This recipe made a lot, four large quesadillas. Between the three of us, there was a quarter of a quesadilla left, which I had for a snack the next day. OMG, this dish wash amazing! Easily my favorite of the week, and just might be my favorite food delivery box meal we've tried. 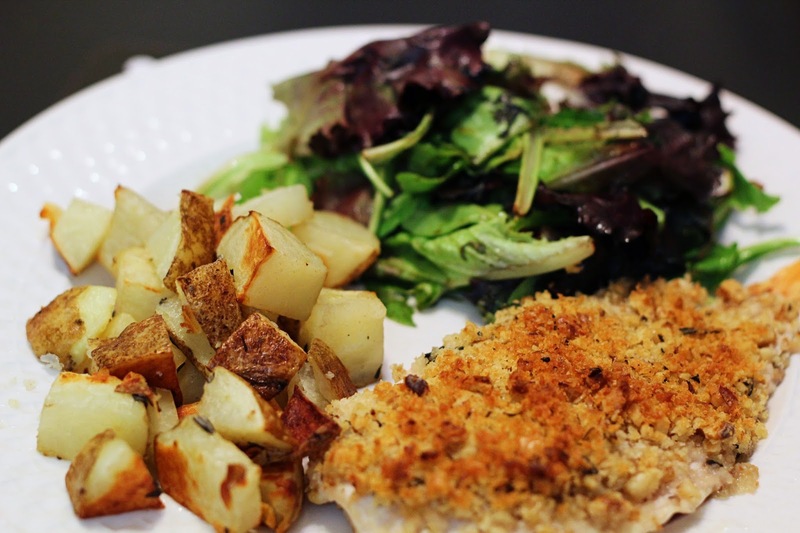 I liked how rounded of a meal it was, with the chicken, potatoes, and salad. Our bag was missing the dijon mustard used to coat the chicken. Unfortunate, but of all the ingredients to be missing, that was probably the best one. 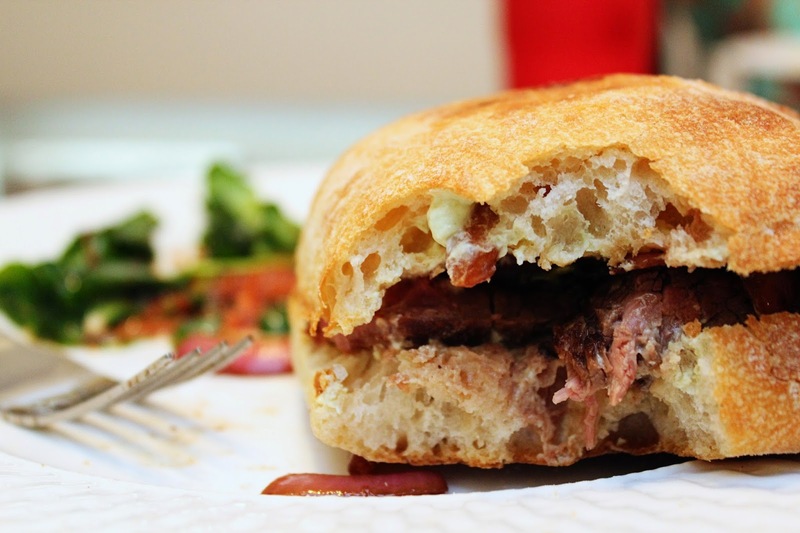 I used a creamy dijon mustard we had in the fridge, and it worked just fine. Next time I go to the grocery store I'm picking up all the ingredients to remake the chicken, it was too good not to make again. Leftovers: Just a bit of salad, which Ant took for lunch at work. This was Ant's favorite meal of the week. It was so full of flavor! The sour cream/horseradish/dijon mustard sauce was excellent, and the roasted tomatoes in the salad were a really unique touch. The dressing was the same as the salad from the night before. The olive oil and basalmic vinegar was nice, but I wish they would have done two different dressings. It took a little longer to make than the other two dishes, but it still came together in less than an hour. Leftovers: None, we ate every last bite! All three meals were great, and again, I have to give a shout out to my sous chef, Ant. He helped out with two of the meals. 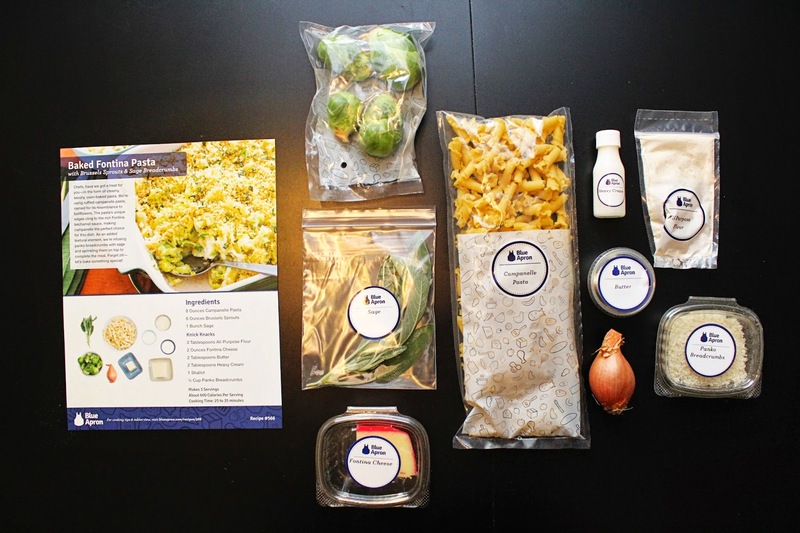 I plan on doing a post comparing Blue Apron and Hello Fresh, where I'll go in to more detail about each service and their pros and cons. Look for that next week. 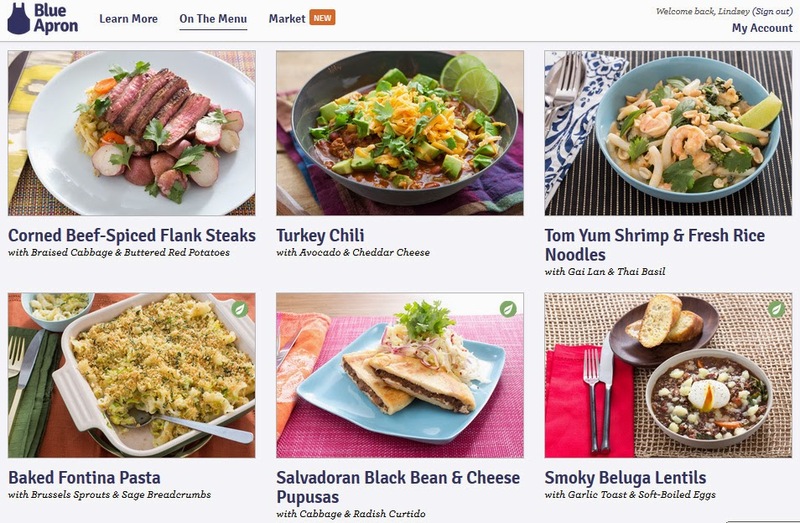 Disclaimer: Our week of Hello Fresh meals were purchased by me, using a promotional $40 off code. I'm not otherwise affiliated with the company, and all opinions expressed in this post are 100% my own. How many times can I say I can't believe how big he's getting?!?! But seriously, he's nearly three and a half! -Last month I mentioned Harry's new obsession with Toy Story. Well, that obsession is as strong as ever. He presses his belly button and yells, "To Infinity and Beyond!" at least a dozen times a day. He knows every character and when I asked him to stop jumping on his bed, his response was, "But Andy does it!" It's cute to see him so excited over something, especially something I loved as a kid (granted, the first movie came out when I was 10). 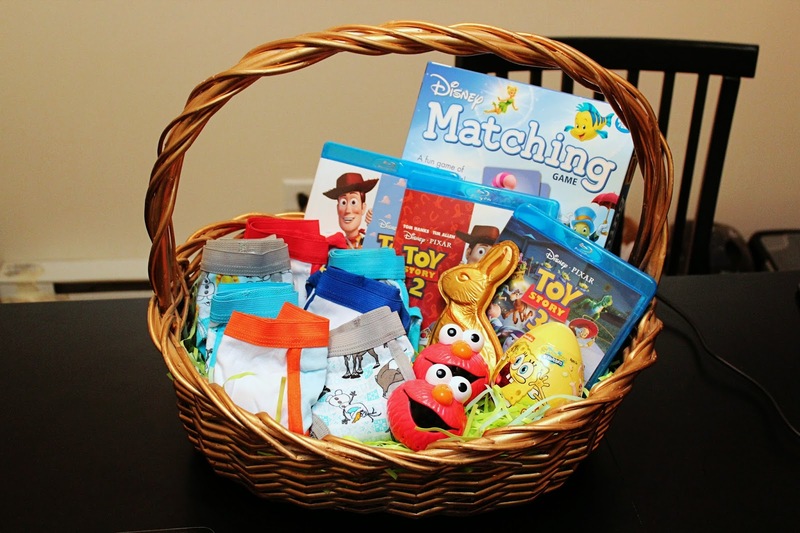 The Easter Bunny spoiled Harry this year and brought him all three movies (I hear it was this set- which appears to be a European version, but we've had no problem playing them in our PS3). Toy Story 2 is his current favorite, he loves Jessie and Bullseye. Also Toy Story related... he was the calendar helper at school one day, and he told his teachers he was, instead, the Buzz Lightyear Helper. -He finally discovered Spongebob Squarepants. I was hoping to keep him away from that show for a while longer. But, he got a little Spongebob toy in a Happy Meal and then saw him pop up on Hulu. I had honestly never seen an episode of the show. I was under the impression that it was crass humor, like Ren and Stimpy. But, fortunately, it's not nearly as bad. The animation looks similar, but it's not that bad of a show. At least from the 5 episodes they have on Hulu right now. 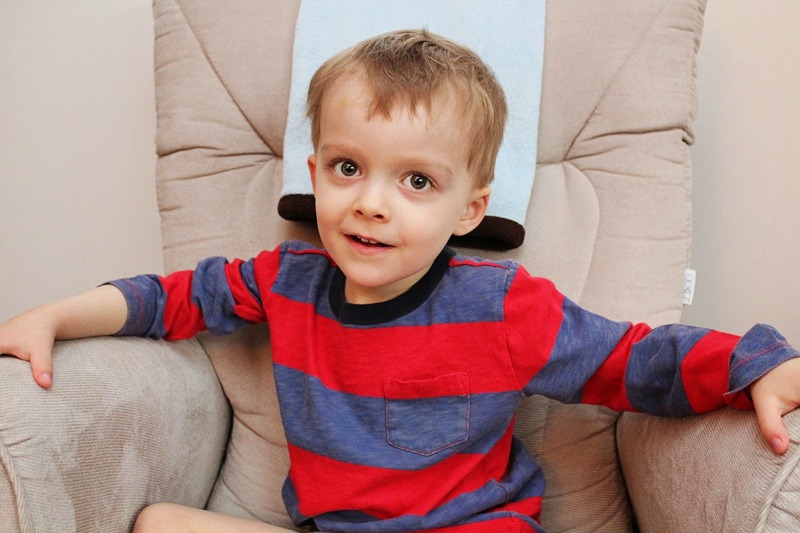 -I am happy to report that we've made some huge strides in potty training this month! Finally! The week of spring break we hunkered down at home and went diaperless most of the time. I had been apprehensive about doing that because I didn't want to clean up pee every other minute, but it really works! He hasn't been 100% accident free, but he's done really well. The next step is to start leaving the house with underwear on. Crossing my fingers that goes well! -He's been back talking a lot this month. Yes, at only three years old! His new thing is to yell, "NEVER!" when we ask him to come sit down for dinner, pick up his toys, etc. I have no idea where that came from. Not too happy he has picked up that habit!! P.S. We've had so much fun with that matching game! If you have a three year old, I can't recommend one enough. So, a couple weeks ago we got charged for a week of Blue Apron meals. I guess Ant never canceled our account and was just manually skipping them each week. He forgot, and 3 meals we really weren't excited about were on it's way (one was a catfish dish that neither of us would touch with a 10 foot pole). We didn't notice until 4 days before delivery, and the site says they need 7 days to cancel. We immediately emailed their customer service to see if there was anything they could do. Fortunately, their customer service team was understanding and canceled our order. We were so thankful that they were able to cancel our order that after seeing how delicious the next week's meal plan looked, we decided to order another box. 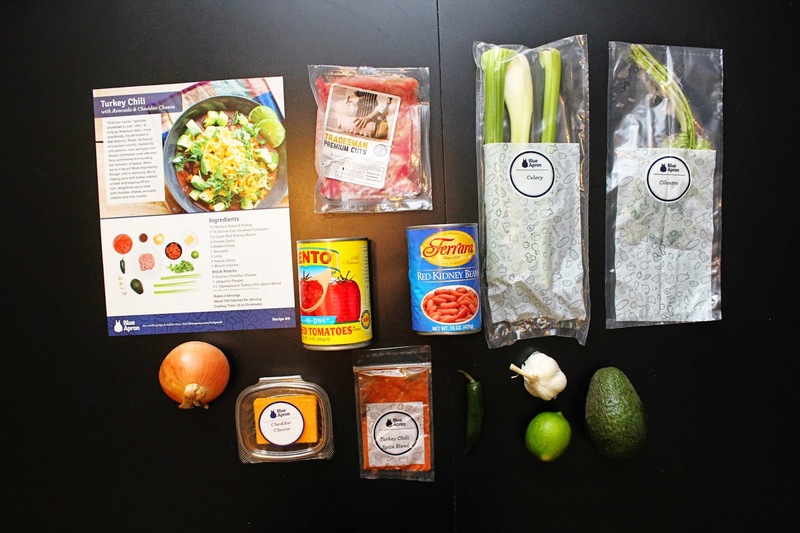 We had a pretty good experience with Blue Apron the first time and expected our second box to be just as wonderful. Blue Apron still doesn't allow you to pick your meals, but we knew we'd be getting the Corned Beef and Turkey Chili- I can't do shrimp- horrible childhood experience, the smell of cold shrimp still haunts me to this day. Our vegetarian option (the bottom row) was a surprise. 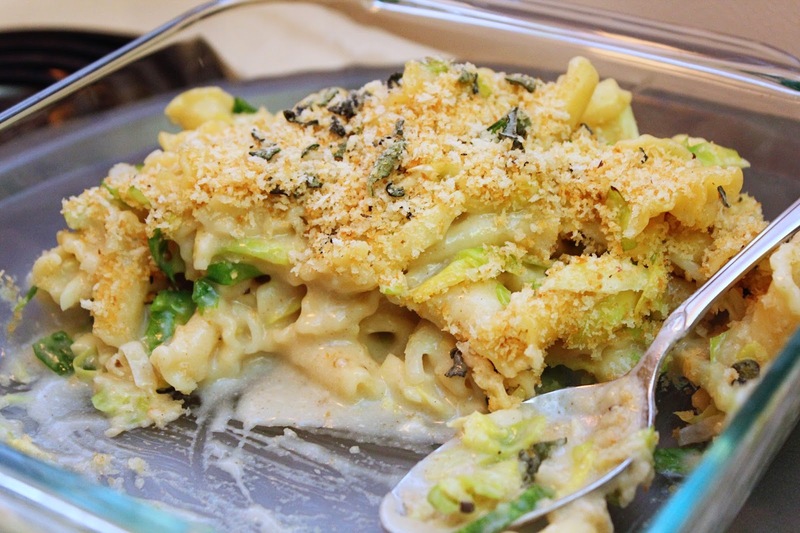 All three looked yummy, and we ended up with the Baked Fontina Pasta. Here's how everything turned out! Our delivery was scheduled for the Friday after St. Paddy's day, so it was a little weird that corned-beef and cabbage was on the menu. They should have done it the week before, but whatever. The steaks turned out really well, the spice rub was very flavorful! The potatoes tasted good, but looked pretty bad. I think I cut them too small, so I shouldn't have cooked them as long as I did. They kind of mashed themselves as I stirred the butter in. New to me ingredient: Cabbage! I've had that purple cabbage in mixed salads, but I don't believe I've ever eaten a green cabbage, at least in the corned beef and cabbage sense. It was mixed with that whole grain mustard I loved so much from our first week of BA, which was a delightful touch. I would definitely eat it again. Leftovers: We ate all the steak, but Ant had some of the cabbage and potatoes for lunch the next day. I make turkey chili quite a bit (my go-to recipe is one from an old Weight Watchers cookbook), so I was curious to see how this one differed. The two are definitely similar, but this Blue Apron chili had more of a kick because of the added jalapeno pepper. I have to say, I wish the BA chili had a bell pepper. The WW one has 2, and I love them mixed in to the chili. Overall though, it was a very nice dish. New to me ingredient: Avocado. Yep, I'd never, ever eaten one. And, they were Harry's very first food! They just always grossed me out- their texture looks anything but appetizing to me. Like a creamy, unsweetened cube of pudding. Or a green body cream. Ewww, I know. 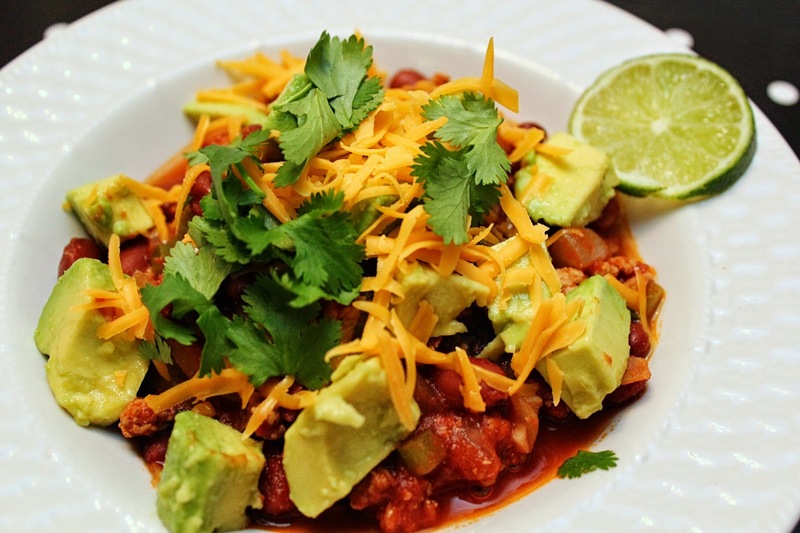 Ant loves avocados, and was super excited to put them on the chili. He begged me to try a little, so I agreed, and put one little cube in my bowl. 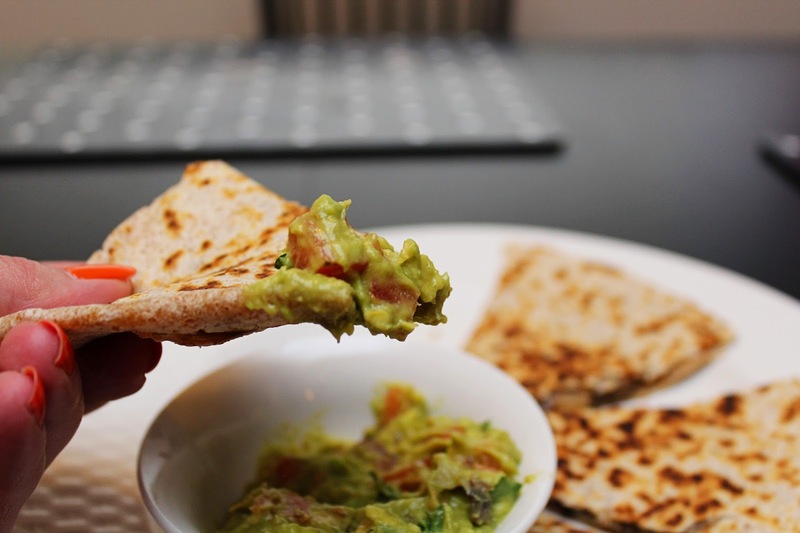 I ate it, and turns out, I don't completely hate avocados! Who woulda thunk. I even added a few more chunks to my chili. It added a nice, light contrast to an otherwise heavy dish. Leftovers: Yes, enough for one serving. I reheated it for lunch the next day. Probably my least favorite of the three we had, but that's not to say it was a bad dish. It wasn't, but I felt like there was either too much pasta, or too little sauce. Altering the measurements slightly would make a world of difference I think. This also was a deceptively complicated recipe! Just glancing at the recipe card I thought we'd be able to breeze through it, but there are a ton of steps. New to me ingredient: Brussels Sprouts. 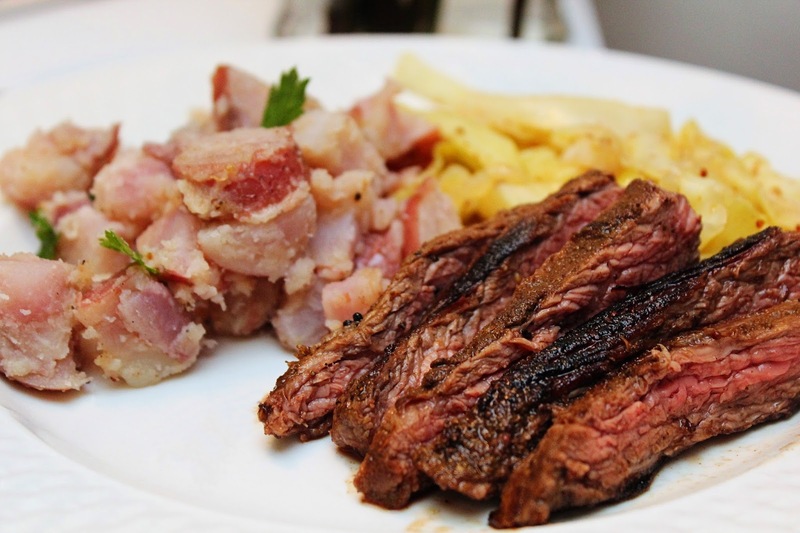 They've never appealed to me and I was really apprehensive about this dish because of them. 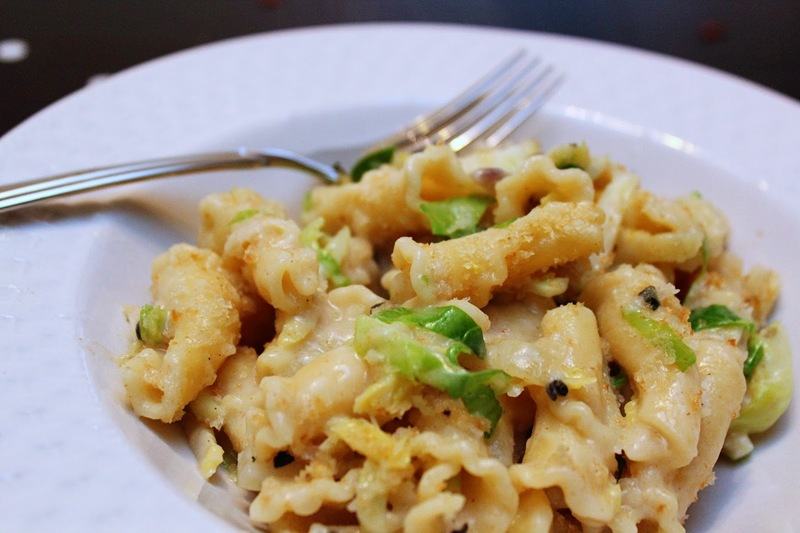 I chopped them up very finely and didn't notice a strong flavor when mixed in with the pasta. I don't think I'd go out of my way to try them again, but if they're in a dish that otherwise sounds appealing, I wouldn't shy away from it. Leftovers: Yes, enough for lunch the next day. It didn't reheat very well, but I finished it. The pasta was really dry, again, if there was more sauce it would have been better. Overall, it was a yummy week! And I have to mention what a great sous chef Ant was. He helped out quite a bit with preparing all three meals. We didn't have as much left over as last time, but every meal fed the three of us (Harry had very small portions, and wouldn't even touch the chili), with a little left over. 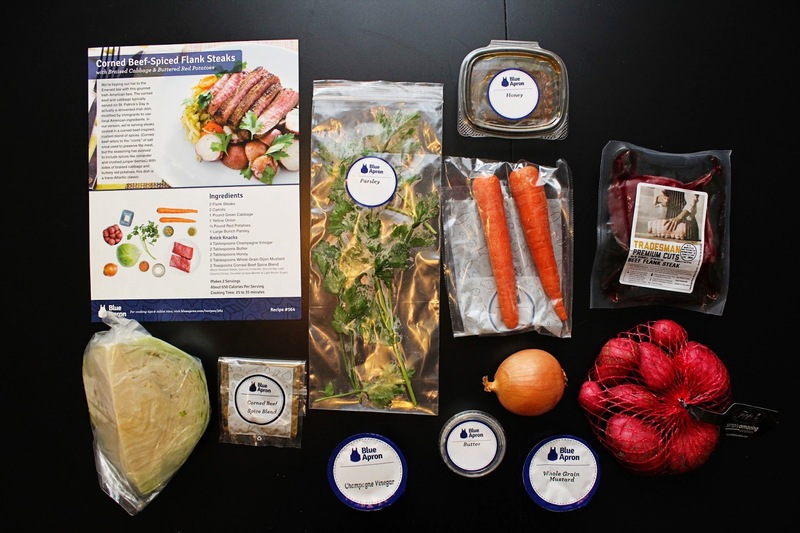 I'm sure we'll do Blue Apron again when another good week comes around. 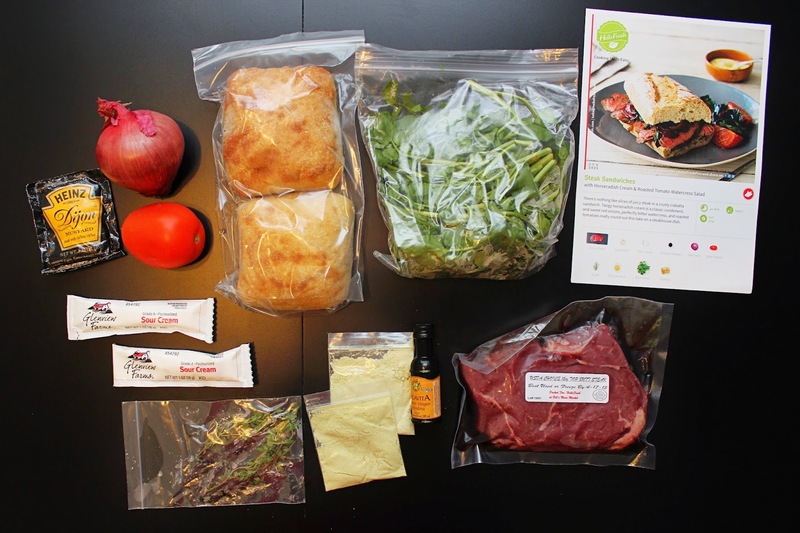 But, next week we're trying out Hello Fresh for the first time, I'm excited to compare the two services! Disclaimer: I'm not in any way affiliated with Blue Apron. The box was paid for by me and the opinions expressed in this post are 100% my own.